Welcome to Arthrex… we are a global medical device company and leader in new product development and medical education in orthopaedics. With a corporate mission of helping surgeons treat their patients better, Arthrex has pioneered the field of arthroscopy and developed more than 8,000 innovative products and surgical procedures to advance minimally invasive orthopaedics worldwide. Discounted Theme Park and Movie Tickets, and More! Arthrex provides an extraordinary culture with exceptional benefits, which makes us a very attractive place to work. In fact, Arthrex made the Fortune Magazine's 100 Best Companies to Work for list in 2015! 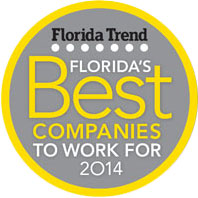 Arthrex was named to the prestigious list of Florida's Top 100 Best Companies to Work For in 2012, 2013 and 2014. Our corporate headquarters is located in beautiful Southwest Florida, and we also offer employment opportunities with our multiple subsidiaries throughout the country and world. No matter where you work within Arthrex, you will find a secure working environment that fosters ingenuity, teamwork and a commitment to quality, as well as the opportunity to reach your personal and professional goals. Arthrex is growing and expanding at an unprecedented rate. In 2011, we were awarded a place on the “Inc. 5000” list of America’s Fastest Growing Private Companies.“ We continue to broaden our product portfolio, which leads to increased investments in facility and equipment expansion, and the creation of new employment and career advancement opportunities for our employees.